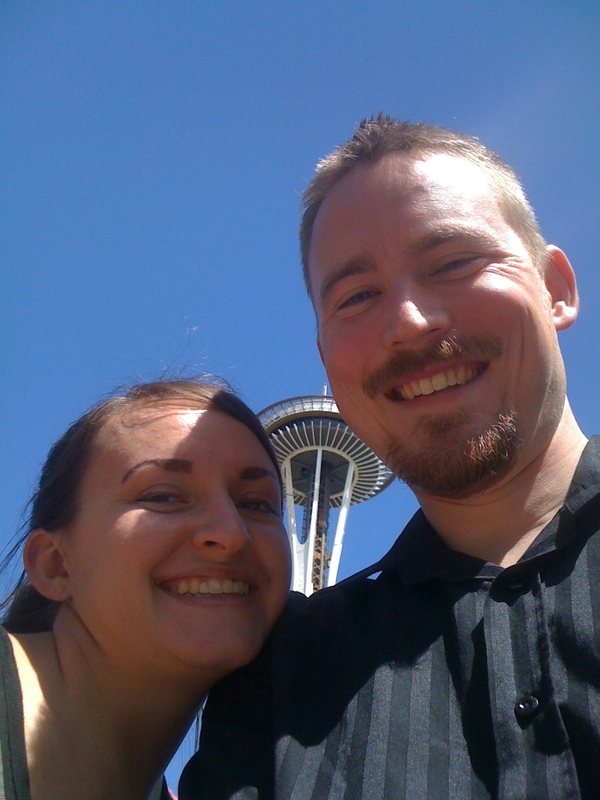 Today Matthew and I took a few hours and went to downtown Seattle, under the Space Needle, for the Northwest Folklife Festival. While neither of us are very folksy, we went for one thing: the contra dancing. Contra dancing is best explained here, but in short, it’s an old folk style of dance that involves a lot of intermingling. It’s super fun and easy – they teach each dance before it is done and the steps are as simple as walking…really. The Folklife Festival brings together the greatest dancers and callers from around the Western US and usually has quite the group of experienced dancers. Today’s dances were a little ho-hum, but probably because it was the start of the weekend. By Sunday or Monday, I’m sure things will be hopping. We won’t be there, but after just a few hours my pregnant head was dizzy and my pregnant feet, crammed into my dance shoes, were swollen. Classy, right? Contra dancing is special for us because we met at a contra dance in Tacoma, WA in 2004 and spent the first year getting to know each exclusively in that format! Matthew often called dances and I would go with him and often some friends to the various locations around Seattle and Tacoma. It was a great start to our relationship, and while we don’t have the opportunity anymore to dance, we are grateful for a brief trip down memory lane. Today was sunny and almost warm the whole afternoon we were there, so we walked around a bit and enjoyed some people watching. We wondered what a Congolese person would think of such a mix of people…I cannot even begin to describe the various types present. It was fun, though, and a nice date afternoon sans our adorable kiddos. They were having a fun afternoon with grandpa back at home. And, in Seattle style, the rain started right back up once we got home. Classy strikes again. ← Welcome Back to WA!